Hibiscus, Rosehip, Apple Pieces, Orange Peels and Flavour. The liquor is bright with a beautiful bouquet and superb fruity flavour. It is naturally caffeine free and extremely refreshing. 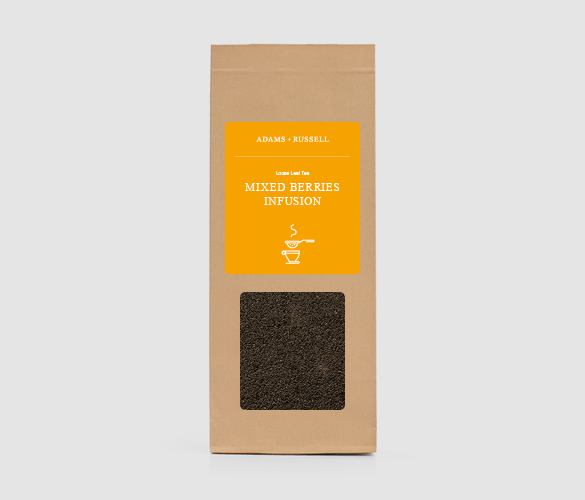 This mixed berry infusion is packed with flavour, and contains ingredients which are surprisingly beneficial. We’re going to have a closer look into the key ingredients in this tea, and tell you how they can boost your health. Contains a good amount of iron, which helps with a few functions in your body such as the creation of red blood cells, metabolic activity and keeping organs well-oxygenated. Another benefit of the high vitamin C content is the production of collagen, which can contribute to your bone health. Should I be drinking this Tea while Pregnant? Some herbal and fruit teas are safe to drink while being pregnant, in moderation. However, Hibiscus is not recommended to be consumed while pregnant, so we would suggest avoiding this Infusion during pregnancy. Since we get through a lot of fruit tea – probably about 20 bags of Twinings Fruit Tea per night – I have been looking for some bulk alternatives. This Berry Tea arrived promptly and like the Lemon and Ginger is not really a dried leaf tea but a mixture of fruit chunks. Infused into hot water (90 degrees C) produces an aromatic red tea with a good flavour. It needs rather a large amount compared to the Twinings equivalent to produce an equal strength even with a longish brew time. The taste is very good and the others in the house like it and are happy to drink it as an alternative to one of the Twinings Fruit Tea – I can’t remember which. I would be happy to buy it again, but I don’t think it will work out much cheaper than the Twinings.